Short print runs with numerous colour changes should be planned to make washup easy. It is often difficult to wash up the press and remove all traces of the previous colour if it is a dark colour like black. Short run jobs therefore should be planned to move from the lightest hue inks to the darkest. The same can be said about damper contamination. Ink impregnated in the dampers may contaminate a lighter colour printed later. To avoid repeated damper washing the jobs must be planned to print lighter colours first. The convertible press utilises a special transfer drum mechanism which turns the sheet over for perfecting. A simple configuration uses the two colour press to print two colours on one side of the sheet or when converted, prints one colour on each side of the sheet. 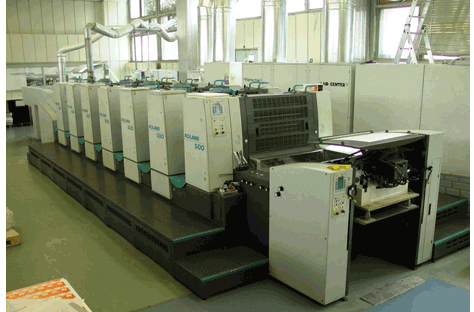 A four colour press can be converted to print two colours on each side of the sheet (see The Perfecting Press).